Each time Crunchy starts, it generates a random session number (10 digit long). When Crunchy fetches an html page, it processes it to remove unwanted code. This means removing all (java-)scripts and only allowing html tags that are on a "whitelist". This whitelist excludes any of the usual "onload", "oninit", etc., automatic execution. Finally, the processed page is displayed in the browser, with the server waiting for user-generated interactions. This procedure is repeated for any page that is loaded during that session. The latest version (0.7) includes this security features and many new additions [a complete list of the changes from version 0.6 is appended at the end of this message]. Currently, Johannes is working on adapting How to think like a computer scientist to use with Crunchy, as well adding new interactive features. For my part, I have been working on internationalisation issues (adding a French interface) and other configuration choices. Due to end-of-summer holidays, work on Crunchy will likely slow down for a few weeks at least but we should be able to reach version 1.0 early in the Fall. After that, I will be ready to start implementing rur-ple inside the Crunchy environment; if there is enough interest, I might implement a turtle graphics module as well. To prevent confusion with an existing program named CrunchyFrog, "Crunchy Frog" has been renamed as "Crunchy", short for "Crunchy, the Interactive Python Tutorial Maker". Feel free to try and break this - and please report any findings back to us. Automatic syntax colouring of (static) Python code, including (as an option) line numbering. Drawing & plotting canvas can be set to arbitrary size. Multiple canvas can now appear on same page. New addition and simplification to the sound api. Simplification of error message (tracebacks) more suitable for beginners. First draft sound tutorial exploring concepts of frequency, beats, harmonics (Fourier series), etc. I'll provide more details later, but here's the short story. You write an html document in which you insert the Python script you want to execute inside a <pre> element with some minor markup (<pre title="external copycode">); actually, you can have as many scripts you want on any given page. Crunchy processes the page, displays the Python scripts in colour (!) and makes a copy of each available for further editing inside a <textarea>. You can then just click on a button and the script is launched. So far, I've launched Tkinter windows, wxPython apps, Pygame programs, a terminal with a Python interpreter and, the latest, a gnuplot window that ran the gnuplot demo. You can actually have a number of independent external apps going at the same time, allowing for some interesting experiments (edit the code in the <textarea> and launch the new version). Stay tuned for more news soon, and the announcement of the next release. It's now been a month since my last blog post and a lot has happened in the meantime. We (Johannes and I) have just released a new version of Crunchy Frog. We were planning to do a release (version 0.5) a bit earlier but we kept "fixing this", "adding that little bit", "changing this", etc., until I felt it was well beyond what had been planned for the next release. So, after discussing briefly about it (at Johannes's request), we set up a roadmap for Crunchy Frog as a whole (as oppposed to just for Johannes' project) with a date set for the 1.0 release that would coincide with the end of this Summer of Code project for Johannes. The new public release (0.6) looks very different from the previous public one (0.4). Crunchy now has its own site. Previously, Johannes had set up an svn repository which has come extremely handy. This summer of code project is supposed to be a learning experience from the student (Johannes) under the direction of a more experienced mentor (that would be me). However, I can say that it has been a huge learning experience for me. So far, I had only worked on my own project, and only very recently had learned to use an svn repository on my own computer. Working as part of a team (supposedly as the team leader [I have the final say, if need be]; in reality, it's pretty much a team of equals, each of us having different strengths) has been an experience in itself. While we have settled on a roadmap, I can already see some additional features, not mentioned so far, that I would like to implement before the end of the summer. For those interesed in Crunchy Frog: stay tuned, there could be some very nice new stuff added soon. The 0.6 release got some attention outside of "regular channels" and I just found out that there exists another Python project named CrunchyFrog (no space between the two words). This, I think, is most unfortunate and I am in a bit of a quandry as to what to do about the name. Note that the developper behind CrunchyFrog, who brought its existence to my attention, not only has not complained about me choosing this name, but has actually set up a link to Crunchy Frog on his own website. [This is something we'll definitely have to reciprocate; Johannes is responsible for the website and is taking a well deserved break after the last minute rush to get everything organised for the 0.6 release.] Nonetheless, the possibility of changing the name of the project has to be considered ... even though Johannes has designed a nice graphical interface based on a Frog theme. just today, a link to a Firefox extension useful to users of Crunchy Frog. This extension enables the "normal" use of a tab key within an html <textarea>, which comes in handy when typing Python code. So, all in all, a busy month with lots of long nights of coding after work. I have a great job, which does not and never will require me to do any programming [sometimes, much to my chagrin.] However, as a hobby, programming in Python has really been a fantastic one. It is my hope that the programs I create will be found useful by others. The title of this post pretty much says it all. I just need to write a few more lessons, read over once more all the existing lessons, do once more all the suggested exercises ... and, barring any surprises, I will be ready to release version 1.0 of RUR-PLE. Thus will end an adventure that started a little less than 2 years ago, as I decided to start a new hobby and learned about Python. A few days ago I was contacted by M.H., a professor in the U.S. who teaches Introduction to Computer Programming every year and was thinking of using RUR-PLE. [Great, I thought, more user feedback to be expected.] Unfortunately, M.H. had tried the latest version and found that the code highlighting feature [described in this post] did not work. How could I possibly find a bug that I can not reproduce? I thought... Thus began an exchange of emails that led me to find a way to reproduce the bug and, eventually, to solve it. The final solution was somewhat typical of my experience with Python: try the obvious! These last three words are probably the best words of advice I could give to anyone who writes computer programs using Python. If you are reading this blog as a potential source of useful tips [you fool! ], you should probably stop now as nothing else I will write is likely to come even close to being as useful to you. However, if you want to get a good laugh at my expense, you are invited to continue reading. I first started by asking M.H. what everyone always asks me when I claim to find a bug or when I don't understand the behaviour of some module and post some question on various lists. What OS and what version of wxPython are you using? I expected that M.H. was using Mac OS or Linux, in which case I was getting ready to diplomatically tell him that he was likely out of luck as I'm [shame on me], a Windows user. However, M.H. told me that he was using Win XP (same here), Python 2.4.3 (I'm using 2.4.2) and wxPython 2.6 (same here). Ok. I was more stumped then ever. This was bugging me... These days, I'm working on Crunchy Frog which will, eventually, include and supersede RUR-PLE. As it is, I have a lot more ideas than time at my disposal to work on Crunchy Frog, and this "distraction" was not welcome. However, I could not ignore it. Since I couldn't reproduce the bug, I asked M.H. if he could do me a favour and insert a print statement in the method where the line number was set for the purpose of highlighting. As I wrote the email, I had a "clever" thought. M.H. is in the U.S. He's probably using the ansi version of wxPython whereas I'm using the unicode version. I bet you something's wrong with that version... Sure enough, my first hunch was right: M.H. was using the ansi version. And the print statement was outputting the same result on his computer as it was on mine. So, if one hunch was right... I asked M.H. to install the wxPython unicode version, which he kindly agreed to. At that time I was visiting my partner who, unfortunately, lives 300 km (200 mi) from where I live. Fortunately, she is extremely patient and puts up with me when I am distracted by a programming problem. I decided to install wxPython and the latest version of RUR-PLE on her computer to investigate some more. Ooops... wxPython is now at version 2.6.3.2. I am sure the version installed on my computer is 2.6.1.0. I read over the "changes" document to see if I can find anything that I can use. There does not appear to be anything relevant. I install the new version ... sure enough, I can "see" the bug (or, should I say, I can't see anything as no highlighting is taking place). I read the "changes" document a second (and third) time, just to be sure. No luck. Time to dig in my code. [... Where is this object initialised?... This could have been written so much better... What was I thinking then (about a year ago)... ] After staring at the code for a while, being convinced that the highlighting information is properly set (it was working before, after all) I am convinced it is a wxPython bug that was introduced. I file a bug report and expect to leave it at that. However, my conscience is nagging me. I decide to look at the code again, staring at the method where the highlighting updates should take place. Here it is, with a few added notes. The information in the status bar (number of beepers carried by robot, etc.) is updated. The animation is paused at each step. Making sure other controls of the application are responsive so that the program can be paused or stopped altogether by pressing the appropriate button, etc. Update the (in-memory) image based on the latest robot action. Prevent the robot from going off the screen. That's it. Not much there. I refresh the screen so as to ensure that the robot world, right next to the code "window", gets updated on the screen when a new line of code is executed, and should be highlighted in the code window. I didn't refresh the code window. It worked before though. and launched RUR-PLE. Problem solved. I guess it was just dumb luck that this refresh statement was not required before. All I have to do now is fix the bug and update the version on sourceforge ... before I go back and rewrite the parts of the code that I didn't find easy to read just a few days ago. There must be some other bugs, somewhere... After all, I did not use any kind of "unit tests" for most of the code. Anyone that tries to use rur-ple and find problems should feel free to report them! Inspired by Ian Bicking's HTConsole, I wanted to see if I could get a simple "Python compiler", similar to Lightning Compiler but using a browser window instead of basing it on wxPython. Having no experience with any web programming, and looking at Ian's code, I thought it would take me forever to get this going. Also, I didn't really want to have to learn about all the packages used by Ian to produce HTConsole. After a few simple attempts with Python's webbrowser module, a fruitless query on comp.lang.python, and some wandering on the web, I came accross CherryPy. To be honest, I had heard of CherryPy before, but had never looked at it as I thought it was something I would never need. output = "The result of"
Type in your Python code. I've upgraded Lightning Compiler significantly. It is now possible to have more than one editing tab. It is now also possible to run doctest suites, with an external file. As usual, it can be found on sourceforge. Lightning Compiler (LC) is a wxPython based app. LC's purpose is to provide a friendlier environment to tests Python code snippets than the Python interpreter. It does include an interpreter (pyShell) but it is most likely to be used for its editor. You can execute the code that appears in the editing window and the output is redirected to an output window. raw_input() and input() are handled via dialogs. The basic layout (output window to the side or below the editor window) is customisable. LC comes in a zip file with a sample app, showing how it can be embedded in other applications, as well as a sample script with doctests and a text file containing additional doctest based tests. I can simply press LC's "docTest" button or "verbose" button to run Python with doctest. are appended to the code in the window, all of which is saved to a file which is then executed by Python, with or without the "-v" option. The result is saved to a second file which is then displayed in LC's output window. Granted, if your script already includes some doctest-based testing within a "standard"
block, this addition to LC may not seem that useful; however, if you already use the "if..." block for something other than tests with doctest and have some docstrings-based tests in your code, it might be worth your while trying LC's new feature. Guido and Kirby Urner are two of the 20 or so participants currently taking part in the Shuttleworth Summit. To put it simply, the objective of that summit is to find a curriculum that will fit mathematics, where a child will have mathematical tools to solve problems, and to acquire their analytical skills, and while making efficient use of technological tools. During the discussion, it has been suggested that a possible way might be to start kids with Logo, then maybe move on to Squeak, then Python. I would argue that a programming environment like rur-ple might be more suitable and sufficient to replace both Logo and Squeak, while being used to introduce Python. Many of my thoughts on this have been influenced by a paper on mini-languages. (I encourage everyone to read this paper.) I should also acknowledge that the basic idea behind rur-ple is not my own, but rather Richard Pattis with his "Karel the Robot", which is mentioned in that paper. I am going to present an admittedly one-sided view in order to invite some discussion. The reality is that Logo and Squeak have been used very successfully with learner of all ages - something I will conveniently ignore in my argumentation! Furthermore, because I want to use this post to try and provide some feedback to Kirby that he can perhaps use while he is at the summit, the depth of some of the arguments presented will definitely be less than satisfactory. Let me jump straight into the discussion by first arguing Logo might be too complicated as a first step, for at least two reasons. In decreasing order of importance, they are: 1. Advanced geometry; 2. Too many (complicated) commands. Furthermore, I would argue that Logo is limited in its ability to introduce problems requiring analytical skills. First, Logo (and similar turtle graphics environment) uses general two-dimensional motion. The mathematical concepts that are needed/introduced include length and angles (measured in degrees). While integer values are used, units of length are too small to be easily measurable on the screen. By contrast, rur-ple uses restricted two-dimensional motion, as combinations of either vertical or horizontal motions. The basic stepsize is easily measurable on the screen. While rur-ple is designed to introduced coordinates (which are, arguably, a fairly advanced mathematical concept), programs can be written without making any reference to this concept. Furthermore, even without writing an actual program, one can guide the robot, making it move and turn by using the keyboard; this can be useful in visually determining the order in which instructions must be written. Note that, in a future version of rur-ple (after I complete version 1.0) will include a second environment which will be essentially a "turtle graphics" environment, like that of Logo. Second, Logo generally include the following commands (written in non-abbreviated form): forward #, backward #, right #, left #, pen_up, pen_down, restart (cs), as well as a repeat instruction. Note that the symbol "#" refers to a numerical variable. 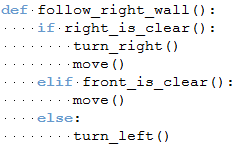 By contrast, rur-ple's basic commands are: move(), turn_left(), pick_beeper(), put_beeper(), and turn_off(). Rur-ple also includes a repeat() instruction. One can easily make a correspondance between Logo and rur-ple's commands and see that Logo includes two extra commands (backward and right) that can be emulated by appropriate combinations of other commands. Granted, the previous argument is a bit weak... However, note that 4 of Logo's basic commands require the use of an additional numerical arguments. This may seem trivial ... but for an absolute beginner, such a combination, like "forward 5" is an advanced concept as compared with a simple instruction like move(). While it is currently not designed this way, rur-ple could (and probably should) be easily modified so that the basic instruction move() could take an optional argument, like move(5), which would more closely match Logo's syntax. This is most likely how the future "turtle" environment for rur-ple will be designed. Another conceptual hurdle present with Logo is the concept of "pen_up" and "pen_down". Again, for the readers of this blog, it probably seems very simple. However, I understand that this is something that has to be explained to learners (especially the younger ones), as it does not have an immediate analogy in their experience. I would argue that a more natural set of commands would be something like "start_drawing()" and "stop_drawing()". This could then later be expanded to something like "start_drawing(color=red)" and "start_drawing(color=red, thickness=2)". Another future expansion of rur-ple would be in a third environment, this time a 3-dimensional one (perhaps using Vpython). I have mentioned that Logo is perhaps too limited in its ability to introduce problems requiring analytical skills. This is because Logo's traditional environment is an empty one. By contrast, rur-ple introduce a world in which obstacles (walls) can be present. One can then ask the user to solve various programs, from a simple "climbing a step" to finding a way out of a maze. This is done by introducing, one keyword at a time, Python's syntax. In fact, because the full power of Python is available, one can even easily use rur-ple to program a visual solution to the Tower of Hanoi problem! This brings me to my final, and perhaps most important point. If one is to design a curriculum making use of technological tools to introduce mathematical and analytical skills, the focus should be on coming up with a coherent and progressive set of problems to be given to the students. The main idea should be to use the technological tools to solve the problems and learn about them, rather than using the problems to learn about the technological tools. I have to admit that rur-ple's lessons so far have been written in the second way: problems are introduced as a motivation to learn about computer programming (i.e. a technological tool). Perhaps the result of the Shuttleworth Summit will influence future lessons that will be included with rur-ple! Python wish: a new meaning for "import ... as ..."
would result in the variable __name__ inside this_module.py being assigned to SomeNameChosenForTestingPurpose. This would allow the inclusion of the testing code to be always kept inside a given Python module. To build a test suite, one would only need to have a module that does a series of "import ... as ..." statements. As it is, __name__ is either equal to "__main__" or the original name of the Python file (this_module in the example above). is called as the main program. Was rur-ple broken for Linux? A while ago, I made some changes with the help of a MacOS user so that rur-ple could work properly with that platform. Since then, many people downloaded it; I assumed that everything was working properly as there was no bug report - until tonight. Under Windows, if you start rur-ple by double-clicking RUR_start.py (which is what I always do), everything is ok. However, if you start it [version 0.9.5] with "python RUR_start.py", nothing happens! I assume that this is the way it is invoked by Linux users too... I just made a small change which should make it work. The new version on sourceforge is 0.9.5a. If there are any users out there who could report if it works properly (and under what operating system), I would be most grateful! As requested by a user, I've added the possibility to pass arguments to a running script. The arguments are passed as a string (named _Args). The new version is available from the usual place. One thing I have noticed is that scripts that contain encoding information give a run-time error. It is thus necessary to remove the encoding information (a line like # -*- encoding: latin-1 -*-) prior to running the script. If anyone knows of a different workaround, I'd appreciate hearing about it. Following some suggestions left by readers on the previous post of this blog, Lightning 1.6 has been released. The main visible change is the possibility to change the layout and have the output window "switched" from the bottom of the editor window to the right of the editor window (and vice versa). The code has also been refactored so that it should be possible to customize various display options (default window sizes and fonts primarily) without having to understand how the rest of the program is structured. Planned for the next release is the ability to simulate running a program with an argument list. Since the release of my little app, Lightning Compiler :-), I have been confronted with design issues that, I imagine, many of those reading this blog face often in the course of their daily work. However, since I only program as a hobby, the issue of ui design is essentially all new to me. Going through the experience for a second time (the first was when I designed rur-ple) has given me a better appreciation of Joel Spolsky writings on the subject. Lightning Compiler was originally meant as a teaching tool embedded in rur-ple. As such, it was very simple by design. Since I "extracted" it from rur-ple to become a stand-alone tool, I have been faced with the temptation of adding various features (creeping featuritis? ), following users' comments (3! ), especially when they had themselves made some modifications that they found useful. I don't want Lightning Compiler to become a bloated app. ;-) Actually, as anybody that has looked at it would know, there is very little danger of this happening anytime soon - at least, by the usual understanding of what a bloated app is. Still, I want to keep it simple and true to its orginal purpose. I would be very interested in hearing about other programmers' comments on my thoughts on the issue of design of an app like Lightning Compiler (L.C. for short), especially given my relative lack of experience on the subject. To provide a starting point to the discussion, here are a few thoughts on the subject. L.C. is meant as a "quick and dirty" little app, useful to test some programs, usually short ones but that would be too long to type (and re-type) at the interpreter prompt. The idea is: type a program, press a button to execute, look at the output; make some changes and repeat the process. L.C. is meant to add a "nice" user interface for input() and raw_input() commands when needed. This is its one "unique" feature as far as I know. L.C. can also be use to run (and modify, and run again...) longer programs obtained from elsewhere - like, for instance, the Python Cookbook. The idea is to be able to cut-and-paste a code sample and run it with as little fuss as possible. L.C. should be as simple as possible to be useful to do this - but no simpler. L.C has two basic windows: an editor window and an output window; print and error statements are redirected to the output window when running a program (and redirected back to the default terminal window afterwards, so that error messages from running L.C. are captured separately). L.C. 's buttons are simple labeled buttons (no fancy image); the idea is to keep it in a single file, as small as possible. Button labels are only in English. Well, this is of course easily changed by an individual programmer; this is a programmer's tool after all. Possibility to hide the output window, giving more space to the editing window (to see more code at once); when hiding the output window, the amount of screen-space it occupies (after possible adjustment by the user) is remembered. Default size of output window just large enough that all "help text" can be displayed at once in it... but no longer. (New) Go to line number feature; should be useful when an error message is seen in the output window. The text from the output window is NOT cleared each time a new program execution (run) occurs; I know that one user changed that default so that his output window is cleared each time. My reasoning is that a user should be able to run the program, change a parameter, run it again, and be able to compare the results of each run. It is easy enough to clear the output after all (ctrl-l or pressing a button). NO find-and-replace feature. This is something that is useful in a full-fledge editor or IDE, but seems to be an overkill for an app of this kind. Help button; just as a reminder that it is available. L.C. has no provisions for running programs that expect some arguments. I believe that if this can not be simulated with an added "if __name__ == '__main__" block, then you should use a different tool to work with. That's it. What are your thoughts? Is there anything that I should have done differently? Lightning 1.3: yet, one more! Version 1.3 is out. I changed the layout to use a wxNotebook, with the first page being the same Python Editor as before, and the second page is an embedded Python Interpreter, for those rare occasions when you just need it. All this, under 20kb (of course, using wxPython to do the heavy work), and it still loads in less than a second on my computer. Lightning 1.2: yet, another new version! Inspired by a comment left on my last post, I made yet another change to Lightning Compiler :-) The output window is now at the bottom, so that longer lines can be easily seen both in the editor window and the output window. The reason I didn't do it like this in the first place was that I found that too little text showed up in the editor window by default. However... the new version has an option to hide the output window (using a button, or directly from the keyboard). Feel free to make more suggestions! As long as it doesn't bloat the program, and that I see some use for them... I'll make the changes to this toy app. Are you tired of retyping some complicated indented code at the interpreter prompt? Do you get annoyed with mixed tabs and spaces? Do you find it troublesome having to start a full-fledge IDE just to test a few lines of code? With Lightning Compiler, you don't have to! Lightning Compiler allows you to open files and save them, or simply type in your Python code from scratch just like a more expensive editor. However, unlike these complicated programs, Lightning Compiler also allows you to test your code instantly, at the click of a button. The new and improved Lightning Compiler even allows you to do all this without even having to use a mouse: you can control it entirely from your keyboard, just like the Unix gurus! If you download Lightning Compiler right now, we'll throw in a source colorizer in the editing window absolutely free. With the source colorizer, you will never make a typo in a Python keyword as you edit your code. In addition, we'll include a tab-to-4 space automatic conversion. And that's not all... Lightning Compiler runs on all major platforms. So, what are you waiting for? You can download Lightning Compiler right now! Lightning compiler is provided as is, with no guarantee. Possible side-effects include: carpal tunnel syndrome, cross eyes, sore neck, and general lack of social life. Python (and its batteries) and wxPython not included. In the past week, I was looking at the stats on download for rur-ple, following the latest release of the lessons and of rur-ple itself, and noticed a fairly large increase. I felt good about that, given all the time I spent on it. Then, I noticed that I could look at individual stats for all the "packages". Much to my surprise, "Lightning Compiler" was responsible for a significant part of the increase in downloads. Not bad for just a little app that was extracted from rur-ple! I even got just about as much feedback (two comments in a week!) on it than I got for rur-ple in about a year. When I first released it, I gave it a version number 1.0, even though it was not very polished. I thought I was done with it as it was answering my needs as a small one-purpose tool. However, as a result of the comments I got, I made some changes to Lightning Compiler, and produced a version 1.1! For those that don't know about Lightning Compiler, it is a simple windowed app: one window is a Python editor, the other an output window. Your can run your code, and watch the result in the output window, with input() and raw_input() handled through dialogs (wxPython based). It is not meant to be a "serious" app, but I find I use it more and more, and almost never use the Python interpreter anymore! We need to define a similar function for every single robot we create (Reeborg, Erdna, ...). what we do in the next section. I will show you first how we can fix our robot so that it knows how to turn right, and explain what I did afterwords. newErdna.turn_right()     # this one works too! And now, it is time to explain. The Python keyword class indicates that we are going to define a new type of "function", one that creates objects. What follows class is: RepairedRobot(UsedRobot). we create a new robot "named" newReeborg which can do (at least all) the same things that the old Reeborg = UsedRobot() could do. 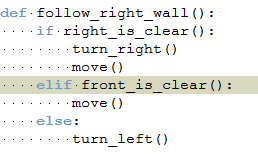 Next, inside the new class, as indicated by the indented block, we define a new method, turn_right(). By defining it inside the class, we take the first step to insure that all the robots that are created by calling RepairedRobot() will be able to turn right!